The Aperio® platform enables more advanced lighting control applications (daylight harvesting, occupancy / vacancy detection, dimming, and presets) to become an integral part of the BAS without gateways. The Aperio® platform is the company’s seventh generation lighting controller, and it will be rolled out over the next several months to a nationwide network of over 100 dealers. The Aperio® platform will be featured in selected Blue Ridge Technologies products including; Relay Panels (RP), Retrofit Interiors (RI), Retrofit Kits (RK), andZone Controllers (ZC). Contemporary Controls has expanded its BACnet router portfolio with a high-performance BACnet router having advanced features including built-in diagnostics that aid in commissioning or troubleshooting BACnet MS/TP networks in the field. With a high-speed 32-bit processor and expanded memory, the BASrouterLX is ideal for larger sub-netted BACnet/IP networks subjected to heavy device discovery traffic. The BASrouterLX provides stand-alone routing between BACnet/IP, BACnet Ethernet, and BACnet MS/TP – all at the same time. It can also route between two BACnet/IP networks while supporting Network Address Translation (NAT) router traversal. Its advanced features include auto-discovery or manual configuration of MS/TP slaves, MS/TP frame capture and storage for use with Wireshark®, authentication, remote storage of configuration settings, and easy firmware upgrade via a web page. As a BACnet/IP Broadcast Management Device, it can handle up to 50 BBMD entries to its Broadcast Distribution Table and 147 entries to its Foreign Device Registration table. For more information visit http://www.BASrouterLX.com. Introducing the Vaisala INTERCAP® Outdoor Humidity and Temperature Transmitters HMS82/83 with integrated solar radiation shield. These transmitters enable reliable and accurate humidity and temperature measurement outdoors. The radiation shield protects the sensor from heating and thus minimizes the distortion of temperature and humidity measurements in changing outdoor conditions. The HMS82/83 transmitters are especially designed for the HVAC marke. Demand-controlled ventilation using CO2 sensors prevents energy losses from over-ventilation while maintaining indoor air quality. The most energy savings potential is in buildings where occupancy fluctuates during a 24-hour period. Numerous organizations now require and/or recommend CO2-based ventilation control in different commercial HVAC applications. Some utility companies also offer rebates to building owners for installing CO2 sensors. Wall mount sensors are used to control a specific area such as a conference room, classroom, meeting hall, etc. The Telaire 8000 Ventostat series are easy to install and have a clean, modern look that suits most indoor environments. Artila Electronics, the leading solution provider for ARM based embedded computing, is proud to release Matrix-505 ARM9 Linux ready computer. Matrix-505 is powered by Atmel AT91SAM9G45 400MHz SoC, 128MB DDR2 SDRAM and 128 NAND Flash with Linux 2.6.38 pre-installed. A fault resilient booting function is implemented by using a backup Linux file system in the DataFlash which will automatically boot up Matrix-505 in case the primary NAND Flash fails. 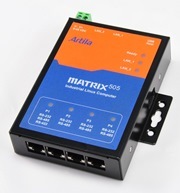 The Matrix-505 integrates two 10/100 Mbps Ethernet, four high speed RS-232/485 serial ports, two USB hosts and a microSD socket into a palm size metal box. The DIN-Rail and wall-mounting capability also make Matrix-505’s onsite installation flexible. Matrox® Graphics Inc. announced the upcoming release of MuraControl™ 2.0 for Windows® video wall management software for Mura™-based video walls. The new version responds to video wall integrators’ requests for even greater control over Mura MPX-based video wall content and layouts. Key new features include transparency and color-keying effects, the addition of local inputs and control over them, plus source touring and scheduling functionality. The new software will be demonstrated for the first time at InfoComm 2013 in the Matrox booth (4759). It will be available for purchase and as a free 21-day trial download in July. Visit http://www.matrox.com/graphics for more information. The ATH is specifically designed to monitor power controlled by phase-angled fired, burst fired or time proportioned silicon-controlled rectifiers (SCRs) in heating applications, without requiring an external current transformer or shorting blocks. Patent pending Time Integration functionality incorporated in the ATH design provides an output signal directly proportional to the RMS amperage to ensure accuracy regardless of the AC current wave shape. The sensor samples the AC current continuously, updating its own time base when the current returns to the load after a pause. Based on the magnitude of the burst and the time interval between bursts, the sensor output represents the amount of power used by the connected load. For more information visit http://www.nktechnologies.com. Wireless Sensors, LLC announces the GWAY-1100 Ethernet Gateway to integrate wired sensors into the data center's environmental monitoring system. The new unit supports up to 24 sensors such as temperature, humidity or contact closure distributed over up to 1000 feet of cable. The Gateway comes with a simple browser-based user interface so, like the company's wireless products, it can be used "stand-alone" by simply browsing in, or coupled to the customer's existing DCIM or BMS software.